Standards Lists makes buying on softchoice.com even easier. With so many products in our catalog it can be challenging to find exactly what you are looking for quickly. 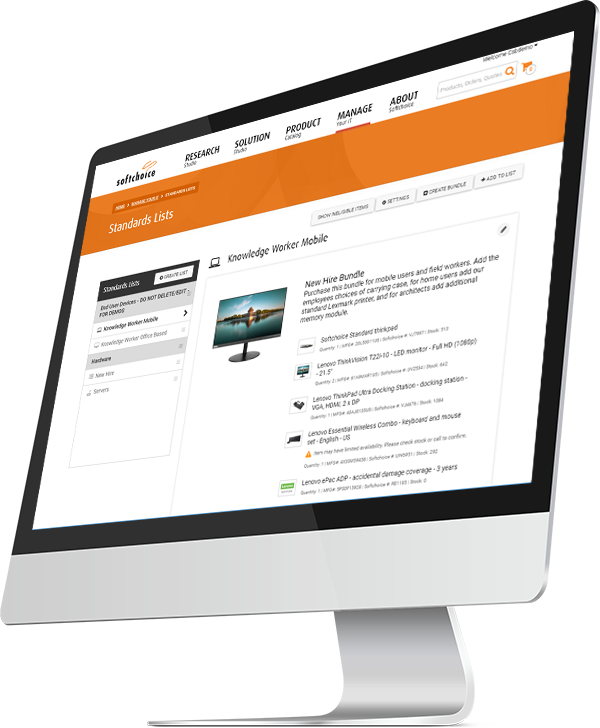 With Standards list you can create lists of frequently purchased/company standard items. Lists can be categorized however you'd like. Our Standards List tool has been designed from the ground up to fit the procurement needs of your organization, making it easy for users to purchase from your company's standardized or commonly purchased products. Can I categorize and group my standards lists? Yes, multiple lists can belong under a category. The category names are free text so they can be can be setup to your liking. What sort of items can be on a standards list? A standards list can contain bundles or individual items. All items in the bundle can be added to the shopping cart in one easy click. Lists can also contain any other item that is available in our catalog. There are no restrictions on what can be part of a list. The site administrator or anyone with admin rights can setup bundles. To do so, click on the Create Bundle button, give your bundle a title and description, search for items on the right and add them to your bundle. You can also customize item titles, descriptions and default quantities. Once you are finished click Save and the bundle will be available. What happens when an item goes obsolete? When an item goes obsolete, it will still show up in the list but it cannot be purchased. Email notifications can be setup so when an item does drop off, a notification email will be sent out. You can then work with your account rep to find the appropriate replacement item and update the list with the new item. To enable Standards Lists or to learn more about this feature, fill out the form below. A member from our Sales team will reach out to you shortly.